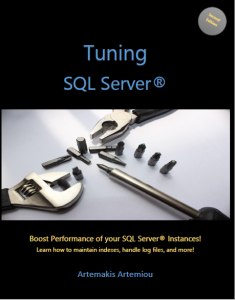 In Microsoft Azure, there are two main options for SQL Server services. The first option is Azure SQL Database (PaaS). 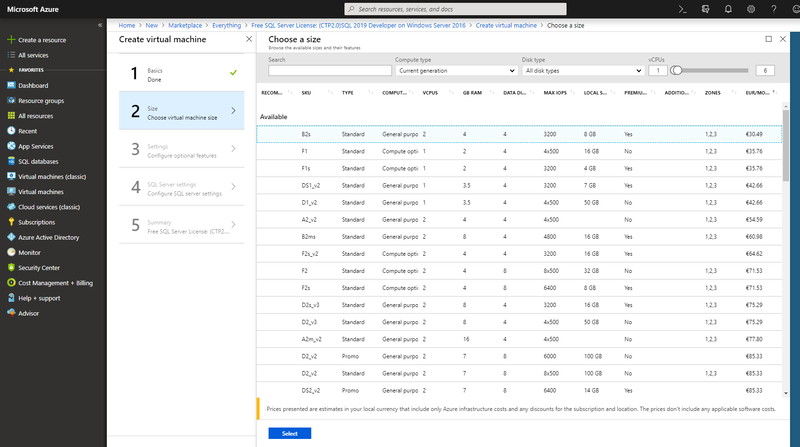 The second option in SQL Server on Azure (laaS). 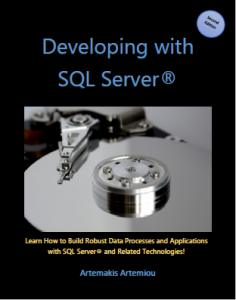 In a previous article, I explained how you can create a SQL Server instance and database on Azure SQL Database. 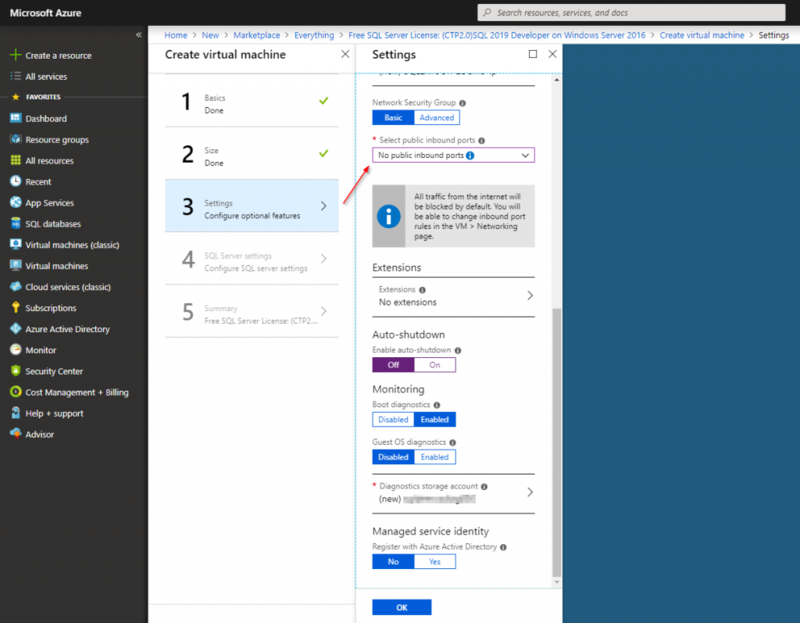 In this article, we are going to see step-by-step, how to create an Azure SQL Server Virtual Machine. 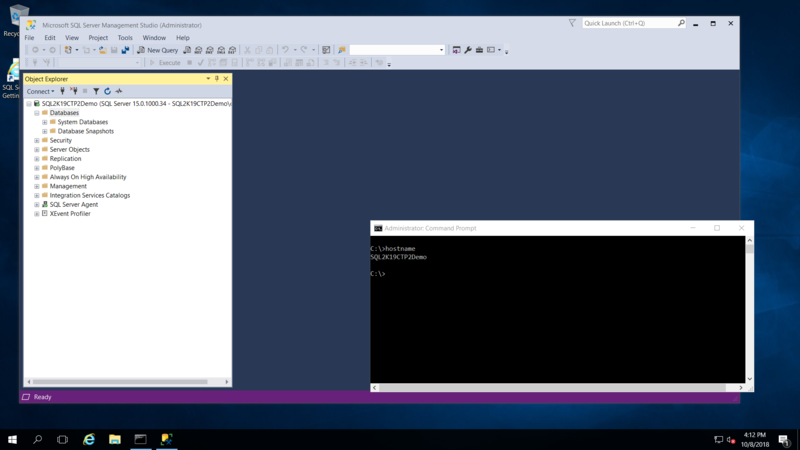 More specifically, for this article, we are going to create a simple VM with SQL Server 2019 CTP2.0 (learn what’s new). Note: Since this is a demo, I will be following a simplified process, thus not taking into consideration all best practices. 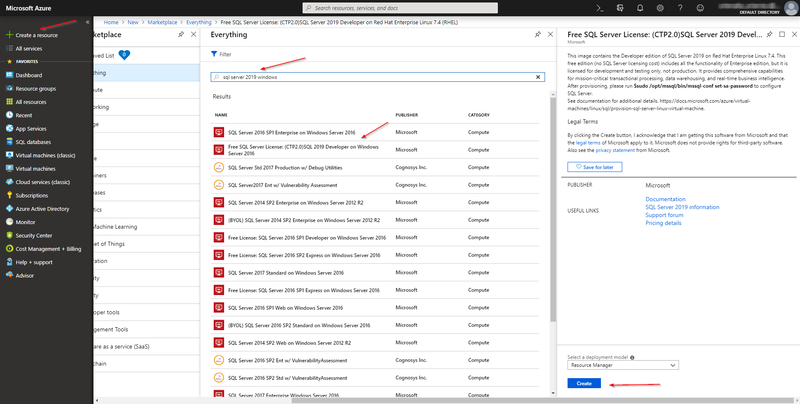 Click the “Create a resource” link and search for “SQL Server 2019 on windows“. Then, select the template “Free SQL Server License (CTP2.0)SQL 2019 Developer on Windows Server 2016″ and click on the “Create” bvtton. Important note: Since this is a demo, I’m using the developer edition of SQL Server which can be used for testing/demo purposes. 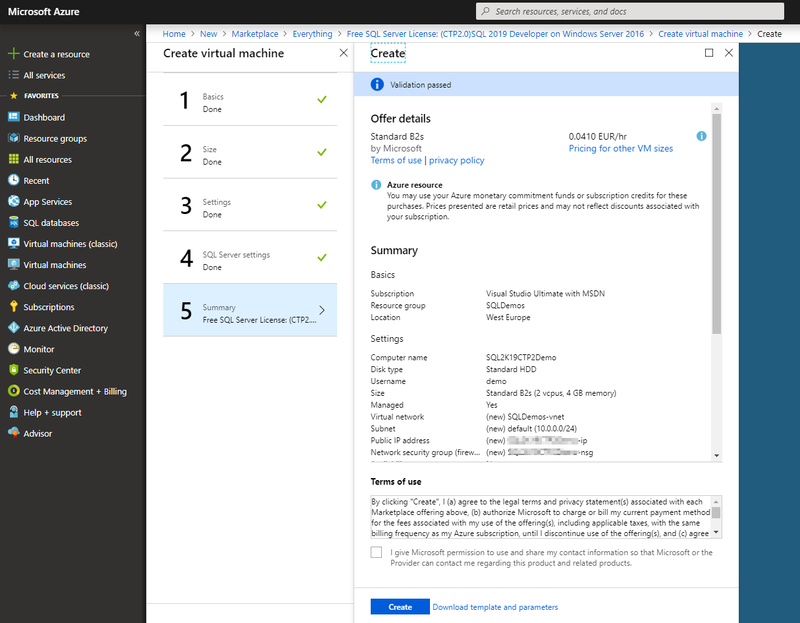 In case you want to create an Azure SQL Server Virtual Machine for Production purposes, please read here for pricing. 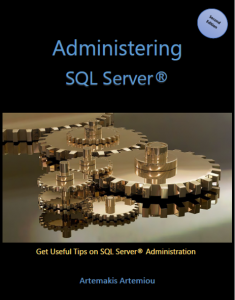 After clicking the “Create” button, you will need to configure the SQL Server VM. In the below screen, I’m configuring some basic settings. On the next screen, I can set optional features but since this is a demo, I won’t set anything special such as high availability etc. The one thing I would like you to note at this step, is the “Select public inbound ports” option. For this option, for the time being, I selected “No public inbound ports” as I will set it up later, in a more controlled manner. Security note: You need to carefully control which IPs can access your online resources on Azure. Therefore, you don’t just “enable” something. You need to have full control and always go through the advanced settings. OK, cool. Let’s click on “OK” and proceed to the next screen of the basic configuration of our SQL Server VM. 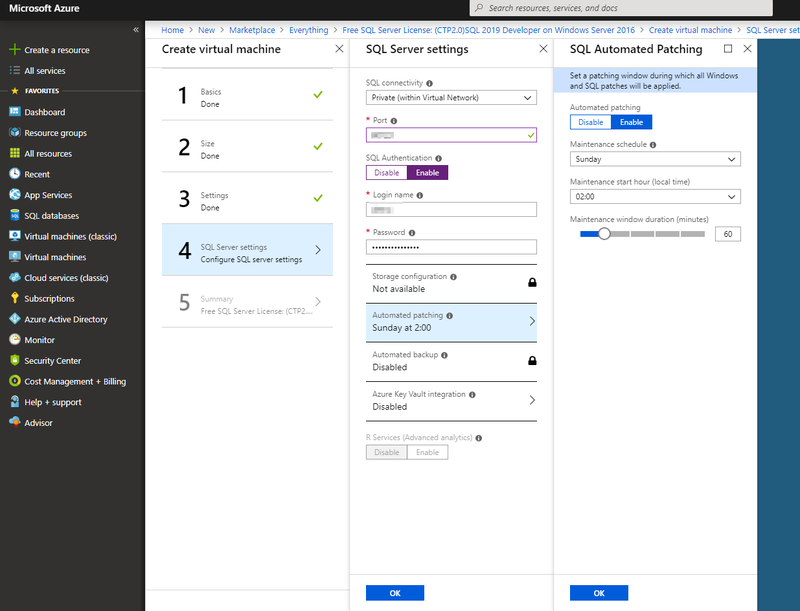 Security Note: If you choose “Public” for the “SQL connectivity” option, you need to carefully set security in order to protect your SQL Server instance within the VM from potential unauthorized access from the Internet. That’s it! After you click on the “Create” button, your Azure SQL Server VM will be created, based on the settings you’ve set. Now that my VM with name “SQL2K19ST2Demo” has been deployed, I need to access it. Security Note: It is critical to be very careful when adding or modifying firewall rules for your Virtual Machines. Always work with specific IPs and Ports, especially in cases where you expose any resources to the Internet. Also, consider using VPN for site-to-site connections. Now, as you can see in the below screenshot, I have managed to successfully connect. 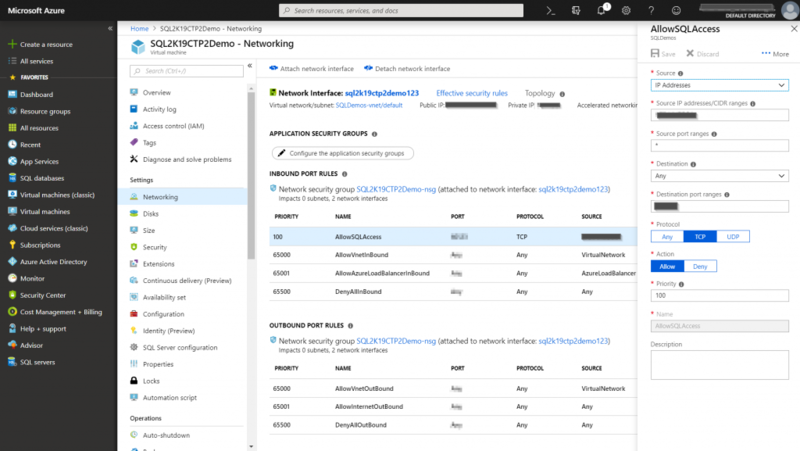 In order to connect to SQL Server on the Azure VM using SSMS, again, like in the case of the RDP connection, you need to manage your firewall rules. If you haven’t added a firewall rule during the VM creation, if you want, you need to add an inbound firewall rule in order to allow SQL access. Take for example the below screenshot, where I have added an additional inbound firewall rule for my VM. As you can see, I’m only allowing inbound traffic for my IP (source IP) to one specific port (SQL) on my VM. Now, I will try to connect to my Azure VM’s SQL Server instance using SSMS. In the “Server name” field I entered the public IP of my VM, as well as entered my credentials. Therefore, before clicking on the “Connect” button, in the “Connection Properties” tab, you need to check the “Trust server certificate” option. Azure Virtual Machines is a very fast and handy way to create, among other, SQL Server machines. Microsoft Azure provides a large set of virtual machine templates, which make the whole process easier and faster. Moreover, you can fully customize the VM during its creation, and later. In this article and demo, we created an Azure SQL Server Virtual Machine with SQL Server 2019 CTP2.0, and we managed to connect using RDP and SQL access via SSMS. As with creating any resource on Azure, when creating Azure Virtual Machines, you need to be very careful with the network/firewall permissions you set, especially in the case where the VM is exposed to the Internet. Moreover, consider using VPN for site-to-site connections.